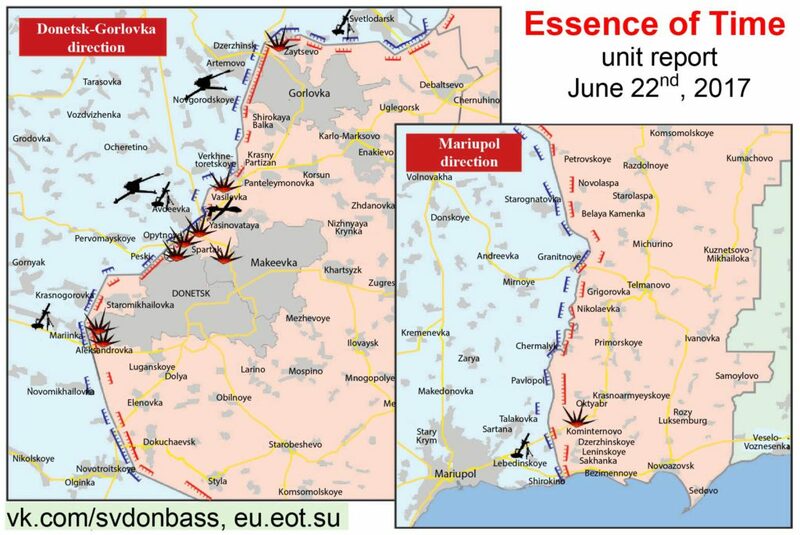 The Ukrainian army continues to shell the villages and towns of the Donetsk People’s Republic (the DPR), fire intensity remains high, a source in the Donetsk People’s Republic People’s Militia (DPR PM) informed a Rossa Primavera News Agency reporter on June 22. The Ukrainian army opened fire on the village of Zhovanka in the outskirts of Gorlovka with automatic grenade launchers and heavy machine guns. The Ukrainian army is active on the Donetsk part of the front. The Chervonogvardeysky district of Makeevka and the villages of Spartak, Trudovskiye, and Aleksandrovka came under Ukrainian artillery’s fire. Around 10 objects of civil infrastructure were damaged. In the night, power lines transmitting electric power to the pumping station of the South Donbass water pipeline were damaged as a result of the shelling of Vasilevka. Emergency power system was used to supply the pumping station with electric power. The restoration works are being conducted. Trench combat using artillery and mortars was underway in the areas of the “Yasinovataya” checkpoint and of the former Donetsk airport. Ukrainian reconnaissance drone was spotted in the skies over Yasinovataya. The Ukrainian side is provoking trench combat on the Mariupol part of the front. 8 houses were damaged by the Ukrainian military’s shelling of Zaichenko in the Novoazovsky district. The Kiev military continues to redeploy heavy weaponry to the contact line. DPR PM intelligence uncovered the location of one battery of 122mm D-30 howitzers near the village of Novgorodskoye. There is also information that one battery of 152mm Giatsint-B artillery guns was redeployed in the area of Semenovka. On June 21, the Ukrainian army violated the ceasefire 41 times. 16 towns and villages of the Republic were shelled. One house burnt down in the village of Krutaya Balka, 3 houses burnt down in the village of Aleksandrovka, one house was damaged in the village of Zaytsevo.